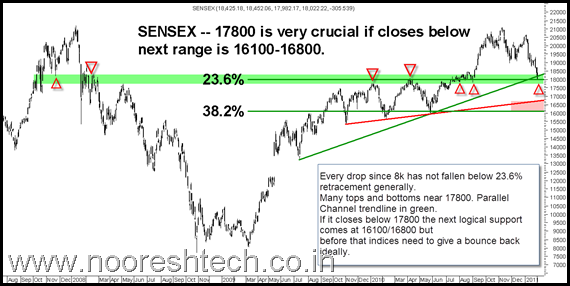 Sensex – 17800 should hold on closing basis else bigger crack is possible. Although when markets are falling sharply an exercise to find supports and a bottom is never a good thing to do but markets cannot keep going up non stop neither they can fall non stop so we keep trying. In a falling market no support is respected. but we can confirm a bottom only after a follow up which is lacking for now. The moves are always zigzag with pullbacks needed in every trending move. we may be in process of finding the bottom. - > As we see from the chart Sensex is flirting close the paralllel channel trendline shown in green. - > The last few tops for Sensex were at 17790/18047 and another bottom at 17820. - > All the downmoves ever since 8k have not given a sustained close below 23.6% retracement which roughly comes at 18000 levels. - > all the indicators are in highly oversold zones. - > If it breaks below 17800 we could expect the markets in a downward correction and may test 38.2% or more of the rally taking it to 16000 levels. Ideally even if markets have to drop to 16k they should first see an intermediate bounce and test 18800-19000 breakdown point unless there is some panic which can be caused by an announcement. Considering a possibility that Sensex can give a whipsaw in the day we may take a stoploss of 17700 on intra day and 17800 on closing basis as our stoploss for all longs bought yesterday. For now the view has been to deploy part of the cash and still stick to 20% or more cash with a view that we may see a bounce back where we may again lighten positions and review positional longs only on close above 19200/19600. The preferred scenario remains that index holds on to 17800 on closing basis but one needs to be ready in case it does not. In case Sensex breaks 17700-17800 we may review the situation on a drop to 16800 or on a close above 18400. In the next post will be posting technical suport levels for many stocks. 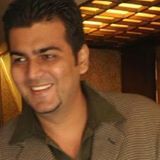 Hi Nooresh, how about getting into real estate now? Stocks like HDIL looks quite beaten down.